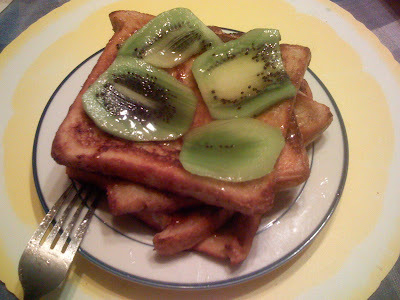 I've done French Toast many years ago, but somehow I did not get it right and though it was a real easy recipe to do, I never tried it again. Until yesterday. We were having a lazy afternoon and I thought I'd give it another go for our snack. And boy was it yummy! Now I think I know where I got it wrong before. I made the bread stay too long on the egg-milk mixture so I really had a difficult time cooking it, and came up with soggy bread. The trick then is to lay the piece of bread on the mixture and let it stay only for a second or two, then flip the bread to its other side for another second or two, then transfer to the pan. Bread is like sponge. It will soak up as much as it can so do not let that happen. As you can see, you really only need milk, eggs, sugar, butter and bread as the core ingredients and these are normally part of your ref and cupboard staple. So give this a try! On a bowl or any other container that can accommodate the mixture and the bread slice one at a time (I used a plate with raised edges), scramble the two eggs. Then add the sugar and the milk and continue beating til well mixed. Heat up the pan over medium heat and place spoonful of butter. When the butter is melted and ready for frying, take one piece of bread, quickly coat both sides with the milk-egg mixture, and place it on the pan to fry. Lightly brown both sides. This will take a couple of minutes per side. Repeat the coating and frying process for all the sliced bread. Pile on top of each other, put your favorite fruits on top, and drizzle with maple syrup (if there's some around). I discovered that you will actually still have much of the mix left for more bread ... I'd guess there's enough for 4 more slices. PinkCookies: Oooh talaga? Will try peanut butter next time. Pink Cookies: Ah oo, ginagawa namin yun... peanut butter and jam! Kakaibang texture!